Do add apples, as the children will like them. Did you know that 99% of food allergies can be cured? I cured my gluten intolerance in my 20s. I did it by changing my diet and taking therapeutic grade probiotics. How to introduce cultured or fermented foods. and either aid in proper digestion, assimilation of nutrients, etc. or else they prevent it when the bad bacteria outnumber the good. Imagine a scale in your mind, balancing the good and bad intestinal bacteria on either end. and tipping it in the direction of a healthy digestive tract. cultured and fermented foods are actually delicious and offer so many health benefits! we are in dire need of a bit of help to tip the scales back in the right direction. and you have a real recipe for poor digestive health (which in turn leads to poor health in general). allow to cool to blood temperature, add 2 probiotic capsules. Culture in warm place/yoghurt maker for 10-12 hrs. Set in fridge, then stir (as it will separate). There is a specific probiotic strain that helps eczema - Lactobacillus rhamnosus. children love these, when flora is healthy - imagine no flu. Carrots, salt, water, garlic cloves and fresh dill. Cover with filtered water and 2Tbsp of real salt (Celtic, Himalayan). Put a glass/jar with water in it (for weight) to keep carrots submerged. squeezing the cabbage and salt together, kneading it thoroughly. This will help break up the cellular structure of the cabbage. 6. Screw on the lid tightly and allow it to sit at room temperature, undisturbed, for at least seven days. open and release some of the air, ensuring you keep the cabbage submerged when you replace the lid. You can always make 1 head of cabbage using half the salt..
Want to learn more? Read this: probiotics-lovethatbug.com/benefits-of-sauerkraut. use freshly harvested, organic, well-cleaned vegetables. spin them dry. Clean equipment is essential. Scald everything you use in very hot water. Add enough filtered water to make a “brine” the consistency of a thick juice. Blend well and then add brine back into first mixture. Stir well. Pack mixture down into a 1½ quart glass or stainless steel container. Use your fist, a wooden dowel, or a potato masher to pack veggies tightly. Roll up several cabbage leaves into a tight “log” and place them on top to fill the remaining 2 inch space. Let veggies sit at about a 70 degree room temperature for at least three days. A week is even better. Refrigerate to slow down fermentation. Enjoy! MISO is so good to use in lasagne etc, ie gives a taste like cheesy sauce for macaroni, casseroles. NOTE - The dill pickles from the grocery store are NOT fermented. They are merely canned, using vinegar, at high temperatures, rendering any bacteria dead and useless. and uses salt to inhibit bacteria while the lactic-acid develops and ferments the food. Below, are online resources, including a few recipes, ways acquire to starter cultures for dairy, etc. and a wide variety of recipes. You will not regret it! Sourdough and Lacto-Fermented Recieps- I don't endorse anything else on this site, but some info is very helpful. Wild Fermentation Site- Some troubleshooting Q&A, tips, a couple recipes, and other links. Probiotics are a great way to keep your digestive system working properly. Lots of people take probiotics in pill form, but we gain more probiotic from food and drinks. What are the best foods to eat to fill your body up with all of those beneficial probiotics? They are full of probiotics, and they are easy to make yourself at home. Here are six cultured foods easily made to help your family have a steady supply of probiotics. Yogurt is the most well-known cultured food in our society. and often contain artificial flavors, gluten and sugar. Make yogurt at home! Methods to try. Milk kefir is similar to yogurt, but not as thick, and has a slightly more sour taste. It makes a wonderful base for smoothies! To make milk kefir, you simply put kefir grains in a jar of fresh milk and let it culture at room temperature for around 24 hours. When it is done, strain the grains from the kefir and repeat the process. Here is a detailed tutorial on making milk kefir, and here is a great source for obtaining milk kefir grains. Water kefir is a sweet, fizzy beverage that is very easy to make at home. The process for making water kefir is similar to that of making milk kefir. To make water kefir, you begin with a sugar water mixture that you add water kefir grains to. You then let it sit at room temperature for around 24 hours. During this time the grains eat most of the sugar and leave you with a delicious water kefir. Then you simply strain out the grains and repeat the process for a daily supply of fresh water kefir. Many people find water kefir helpful for giving up soda pop. It is a healthful beverage besides water without the sugar and chemicals in pop. Instead of those nasty things, it's full of probiotics! is a good source for getting your own water kefir grains. Our whole family loves kombucha, and we enjoy the process of making it as a family. We lovingly refer to it as boocha. Depending on how long you ferment (or culture) it for, it can be a bit tart. We like ours to be more on the sour side, and we love flavoring it with different fruit flavors.Don't ever use Earl Grey tea. The bergamot in it will injure your culture and you'll need to get a new starter. Anything with citrus in it is also bad. There are two different methods for making kombucha. The continuous brew method and the standard brew method. and here is a detailed explanation for using the continuous brew method. A Good brand is -GT Organic Raw Kombucha -from health foods stores. with lots of yeast floating at the bottom - that is the part you use. as the fetus/infant will be subject to toxins that the mother is expelling. Use sourdough starter to make bread, waffles, pancakes, and aother yummy goodies. To get started with sourdough, you will either need to make your own sourdough starter or buy one. Once your sourdough is thriving, you will get into a rhythm of caring for it and then you will be making lots of yummy sourdough goodies to enjoy. Here are some easy (and delicious) recipes to get you started. for more recipes, purchase Sourdough from A to Z book. It is loaded with sourdough recipes that I use over and over again. Note, use this as a condiment. and add a little fermented veg to a meal. 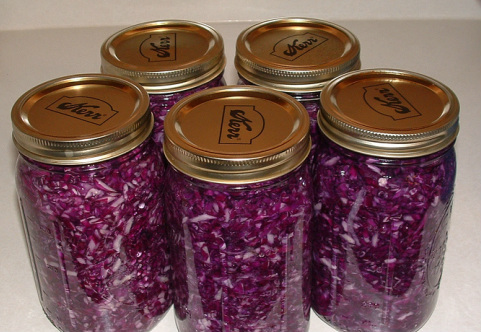 Use lacto-fermentation to preserve garden bounty. Here are a list of simple lacto-fermented veggies for you to try yourself. 1. Order Water Kefir Grains from Cultures for Health or another reputable source. **Sugar Note: The grains will consume most of the sugar as they ferment. The longer they ferment, the more sugar they will consume. (cut amount of sugar in half if making by the quart). (leaving about 2 inches unfilled at top) and stir with wooden or plastic spoon. Spring water with good mineral content is preferable (instead of filtered or Reverse Osmosis water). and letting the water sit over night – choline will evaporate. or add a half (rinsed) pastured egg shell to the jar. 4. Add 1/2 cup of kefir grains (use 1/4 cup if making in quart size jar) to room temperature water. Cover jar tightly with lid, or towel with a rubber band. **Kefir grains can multiply. A good ratio to remember is: 1/2 cup grains to half gallon water to 1/2 cup sugar. Cut amount in half for quart size containers. 5. Let kefir culture at room temperature for 24 – 48 hours. The longer you let it sit, the less sweet it will become as the grains consume more of the sugar. - just over 48 hours is good. Bubbles may appear as it cultures. This is normal (although does not always happen). then try letting the grains culture a bit longer for each new batch. **There is a small amount of alcohol that is produced as the microbes feed on the sugar and produce lactic acid, alcohol (ethanol), and carbon dioxide. This is what causes the bubbles/carbonation. The alcohol content in kefir varies with the fermentation time, and is usually less than 1% . (remember-grains do not like metal), once you are done culturing the grains, and cover with an airtight lid. At this point, rinse your grains thoroughly and you can use them to begin your next batch. 7. Now you can flavor your prepared Water Kefir (or just leave it as is). Fresh Fruit-Flavored: Add your choice of fresh organic fruit to your prepared Water Kefir. strawberries, orange slices, kiwi slices, mango slices, sliced grapes, lemon slices, etc). Dried Fruit-Flavored: Add your choice of dried organic fruit to your prepared Water Kefir. Change dried fruit out every seventh day. Fruit Slushie: Blend your prepared Water Kefir with fresh fruit and ice cubes for a refreshing treat. Strawberries and kiwi are favorite combination in our house. Or add Water Kefir to your favorite smoothies in place of your liquid. This is how you can add "Pro-biotic = For-Life" foods to your body every day! The golden key to overall health is good digestion! “A well-functioning gut with healthy gut flora holds the roots of our health. or heart disease, just to name a few -- it would be wise to avoid grains. This is the same for everyone -- traditionally fermented foods. Fermented milk/ kefir (a quart of unpasteurized kefir has far more active bacteria than any probiotic. particularly vitamin C and B vitamins, and food enzymes. which help to colonize the gut, train the immune system and manufacture vitamins in the digestive tract. In winter, when colds and flus make their rounds, homemade fermented foods which provide plenty of vitamins, food enzymes and beneficial bacteria coupled with fermented cod liver oil (see sources). Toss cabbage and salt in a large mixing bowl and squeeze together with your hands, kneading it thoroughly to break up the cellular structure of the shredded cabbage. When the cabbage is limp and released its juice, transfer to sauerkraut crock or vegetable fermenter. Pack the cabbage into the crock or fermenter tightly, eliminating air bubbles -until completely submerged by liquid. Cover loosely and sit at room temperature, undisturbed, for at least 7 days to 3 or 4 weeks, test the sauerkraut every few days until to your liking. Transfer to the fridge- keeps for at least six months. NOTES: If scum appears floating in the brine of sauerkraut, simply spoon it off. You won’t be able to remove it all, but spoon of what you can. The real key to preparing homemade sauerkraut, and any fermented food, is that the solid materials rest below the liquid. Fermentation is an anaerobic process and to expose your ferments to air increases the likelihood that they’ll become contaminated by stray microbes, yeasts and molds. number one in my book. blend effortlessly with other foods and enrich them, with vitamin A, choline, folate, selenium, iodine, and omega-3 . Eat egg yolks every day. the most nutrient-dense food on the planet, so nutrient-dense that eating more than a pound a week is probably overkill and will net you an excessive amount of certain nutrients. its been marinating in mineral-dense seawater for its entire life, best source of iodine, plus magnesium, manganese, iron, and tons of other trace minerals that you're missing out on. Some of the healthiest cultures consider seaweed a staple food. Sprinkle kelp or dulse flakes on food, make broth using dried kombu, eat seaweed salad when you eat sushi, roll up avocado and meat in nori wraps – the possibilites are many and delicious. is delicious and a true health food. It s primary bioactive component – curcumin – have been shown to be anti-inflammatory, anti-lipid peroxidative, blood lipid-improving, and anti-carcinogenic. sprinkle it liberally on eggs, meat, and vegetables, and make a tea out of it. Add black pepper to increase the benefits. Get bones, cover with water, cook til soft. Make it a routine, good source of minerals and gelatin. balancing the amino acid methionine with glycine from gelatin is advised. Since methionine metabolism depletes glycine. Gelatin improves joint pain and sleep quality. 1200 IU of vitamin A, a third of daily folate, almost 7 mg of vitamin E, 3 mg copper, 280% of daily selenium, and 33 mg zinc. -- with 18 g protein, 4 g fat, 1.5 g omega-3, 0.1 g omega-6, and 9 grams of carbohydrates. Why mussels? - rich in B-vitamins, selenium, zinc, and protein, and good amounts of magnesium and manganese. Other shellfish are also good, but probably not as important as oysters and mussels. natto is a special kind of soy. It’s fermented using a particular strain of bacterium called Bacillus subtilis natto. When steamed soybeans are inoculated with b. subtilis, they transform from a basic legume into a powerful supplemental food imbued with high levels of vitamin K2, a nutrient important in bone mineralization, cancer prevention, and protection from heart disease. -natto is the single best source of vitamin K2. ie sardines, anchovies, smelt. between half inch and six inches long. for the algae, krill, and assorted microscopic marine goodies tiny fish eat, in addition to the omega-3s and protein, and because they’re low on the food chain, tiny fish will be largely free of the heavy metals other, larger fish tend to accumulate. for thepotent polyphenols – bioactive compounds found in plants. ie Organic yogurts, kefir, sauerkraut, kimchis, nattos, beet kvasses, kombucha.